Celebrate St. Patrick's Day with a moist and delicious low sugar Irish Oatmeal Apple Cake. The whole wheat flour and oatmeal provide fibre, while the applesauce, grated apples and buttermilk create a moist base that is similar to a coffee cake. I wanted to bake something to honour my Irish heritage, but was hoping to forego the green food colouring. While flipping through my copy of the Moosewood Restaurant Book of Desserts looking for inspiration, I came across this recipe for Irish Oatmeal Cake and decided this would be perfect. In the Mildly Sweet recipe, I substituted unsweetened applesauce for the brown sugar, and also added a cup of grated apples for extra sweetness and moisture. Preheat the oven to 350 F. Butter and flour the bundt pan. Place the oats in a blender and process until they are the consistency of cornmeal. Whisk into the flour mixture and set aside. In a large bowl, cream the butter until light and fluffy. Add the applesauce and continue to beat until incorporated. Add the eggs one at a time, beating after each addition. Add half of the flour and half of the buttermilk mixtures to the butter mixture and blend well. Add the remaining flour and buttermilk mixtures to the batter and continue to mix until well blended. Use a spatula to gently fold the apples into the batter until evenly distributed. Bake for approximately 40 - 45 minutes or until a toothpick comes out clean. Let cool for about 20 minutes. Gently run knife along edges of pan to loosen the cake, place a wire rack over the top of the pan and invert to release the cake onto the rack. I used a Golden Delicious apple for this cake. It had just the right amount of sweetness for my taste, but you can use whatever you happen to have on hand. 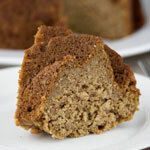 For a sweeter cake, replace the cup of unsweetened applesauce in the Mildly Sweet recipe above with 1/2 cup brown sugar. Cream the butter and sugar together in step 4 before adding the eggs, Omit the unsweetened applesauce. Adapted from: Irish Oatmeal Cake from Moosewood Restaurant Book of Desserts.